So I've been watch-less for the last several months. Last winter I was riding up at USU campus in the snow and assumed that just because I had disc brakes I could stop on steep snowy hills. Well, when I broke my wrist I wasn't too concerned that my old mountain biking watch was ripped off my arm. In fact, I didn't notice it until a day later. Fast forward to last week, when my buddy Jason over at feedthehabit talked me into getting a HighGear Alterra. I've been looking at watches for awhile. Suunto, Timex, and Nike all have great ones. But what was enticing about the HighGear Alterra was the feature to price ratio. Low Profile - No way near as bulky as the altimeter watches from the other watch manufacturers. Lightweight - It's solid but weighs practically nothing. Good Looking - finally, my wrists look awesome!! Barometer - So I wore a poncho and galoshes to work yesterday with blue skies out. The guys were laughing at me until the storm came in. Need I say more? Compass - Graphic display with 360º compass bearing. Adjustable declination. Thermometer - Yeah, its still cold here in Logan. I wish this was a magic thermometer! Ski/Bike Chrono - Input current altitude and base altitude, start chrono and head down the mountain. Chronometer auto-stops when you reach base altitude. Calculates speed of descent. Watch - Oh yea, it tells time too. Dual timezone, dual alarm, hourly chime, etc. 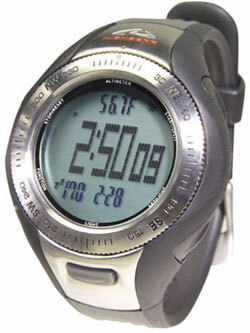 Backlight - Watches that don't have backlights are wall clocks. Water Resistant - 50 meters baby! Price - If you get it from most places, $180, which is still a ton cheaper than comparable watches from Suunto and Nike. HighGear makes a great watch with the Alterra. It's their newest and best watch for serious outdoor enthusiasts. If you are looking for a good mountain biking watch. This is the one for you. I have a few HighGear Alterra's (brand new). I can offer a 30-day warranty at a price of $129.95 (and I'll only ship in the US), after that, you'll need to go through the manufacturer. Buy Now for $129.95. Note: Please call before ordering to ensure I still have them (801-836-2000).